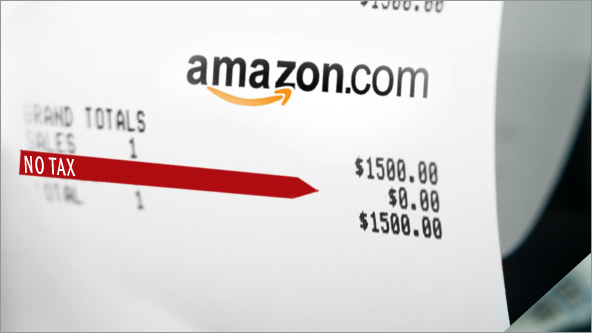 How does Amazon avoid charging sales tax? With so much trade between Asia and the USA these days it seems timely to take a look at the situation with sales tax and the country's biggest online retailer, Amazon. With so much trade between Asia and the USA these days it seems timely to take a look at the situation with sales tax and the country's biggest online retailer, Amazon. Even more prudent to do so since a large number of sellers on the US site are based in China / Hong Kong or elsewhere in the region. So just how does Amazon avoid charging sales tax? What is sales tax in the USA? In the US sales tax, that is tax on the sale of goods of services, is not set or charged at a national level by the federal government. Instead, individual states can set their own rate of sales tax, which is dictated by individual state policies rather than federal legislation. These tax rates can vary widely from 1% to more than 10%. Which goods are taxable or not can also vary from state to state, and some exemptions usually apply. This sales tax is usually collected at the time of purchase by the individual seller. Whereas most retailers must collect sales tax according to state law, Amazon does so only when goods are shipped to nine states - California, Washington, Texas, Arizona, Kansas, Kentucky, North Dakota, Pennsylvania and New York. In many of these states special tax laws have had to have been passed to ensure that Amazon collects sales tax. In other cases no sales tax is due on items bought or sold. The main reason for this is a rule in the US constitution that means that states cannot tax inter-state commerce. This gives Amazon a clear advantage over its competitors, particularly those bricks and mortar retailers in the states in question, as it means that customers can usually get a better deal on Amazon simply because they won't have to pay sales tax on top of the price of the item. Many of the states where Amazon does collect sales tax are those in which Amazon has a direct presence, such as distribution centres or customer service bases. According to Time magazine, Amazon takes the position that to collect sales tax would be unconstitutional, but CEO Jeff Bezos does support proposed changes that could lead to sales taxes being collected across the US. Amazon is also quick to point out that it is little different than any major retailer that does not pay taxes on interstate commerce. Many state governments are keen to change the law so that sales tax can be collected from Amazon and other Internet retailers, and progress is being made on that front. And in some states laws have already been passed which mean that Amazon must collect sales tax from customers. Since September 2012, online shoppers in California have been paying sales tax on their purchases. According to Reuters, the state has now collected almost USD 100 million in the first quarter in which it has been collecting. So for some, tax-free shopping is coming to an end, and with more revenue-hungry states eager to pass similar laws, the time of Amazon's sales tax 'loophole' could soon be over. This is a guest post by Carlo Pandian who is a business graduate interested in finance, start-ups and e-commerce. He is currently writing an E-Book on QuickBooks accounting software by Intuit and has previously published on Help Learn Asia, Startup Malaysia and BizSpace.Asia. ecInsider: How does Amazon avoid charging sales tax?